All Information is Found on the above Flyer & Entry Form. * All prices include 6% Florida Sales Tax. The Goldcoast Ballroom Formation Team, under the direction of Liene & Paolo Di Lorenzo, will perform a Special Medley entitled, “Carmen!” They and the many other highly talented Pro-Am and Amateur Couples who perform always inspire and wow our Showcase audiences! To Perform in the Showcase – Entry Form Due by December 12. 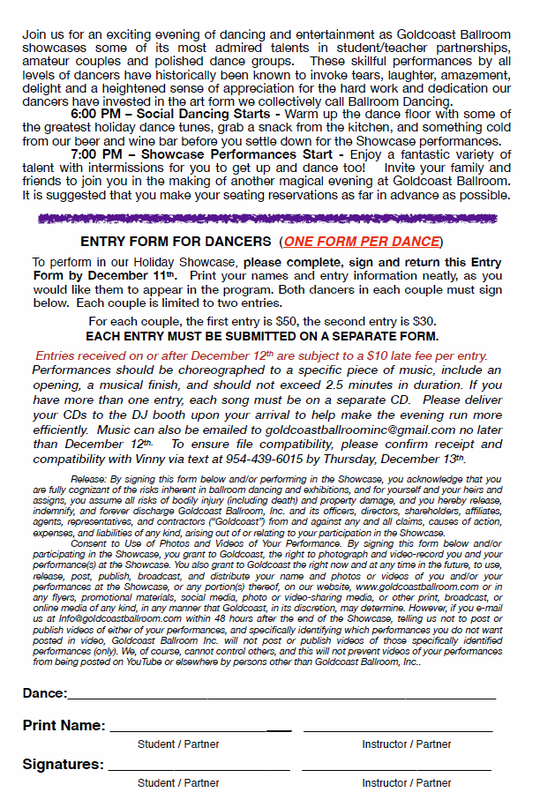 Limit of Two Dance Entries per Couple – Each must be submitted on a separate Entry Form. The first entry is $50 per couple, and the second entry is $30. Entries received after December 12th are subject to a $10 late fee. All prices and fees include 6% Florida Sales Tax. 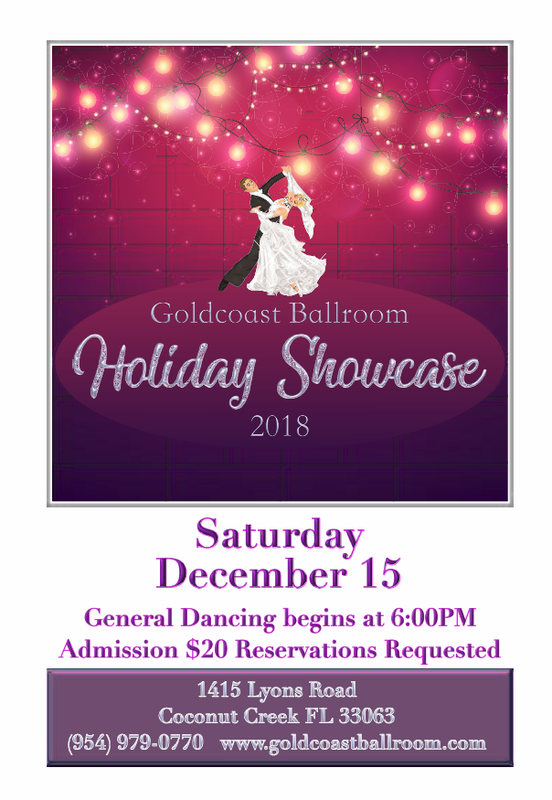 To print out our Flyer and Entry Form for the December 15 Showcase (as a PDF document), click on the Flyer above or below. 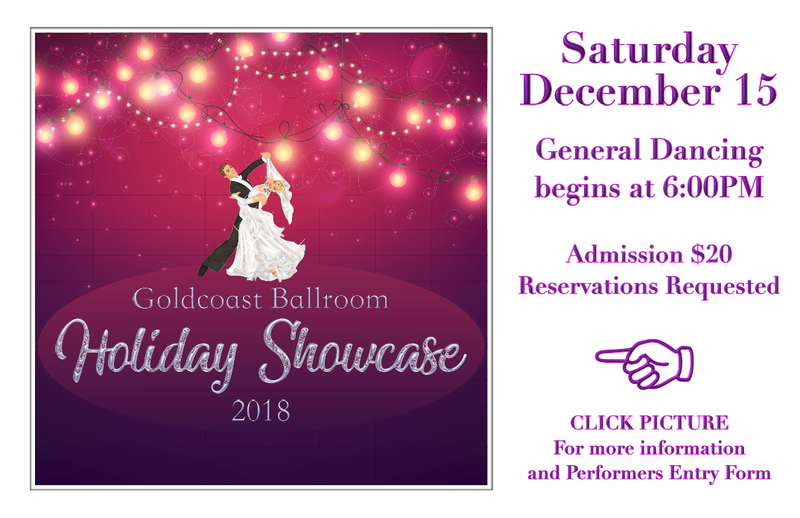 Join us for this spectacular evening of dancing and entertainment as we showcase some of our most admired talents in student/teacher partnerships, amateur couples, and polished dance troupes.